- The World Gallery of Cartoons is organized by Osten – magazine for humour and satire. - It is allowed for one author to send maximum two (2) cartoons. On the back side of the cartoons please write the name and surname of the cartoonist and the title of the cartoon. - Size of cartoons should be on paper format A4 or A3. - The organizer of WGC will not be responsible for any damage that may occur during postage and handling. - The organizer of WGC will keep the cartoons as part of collection of museum of WGC. 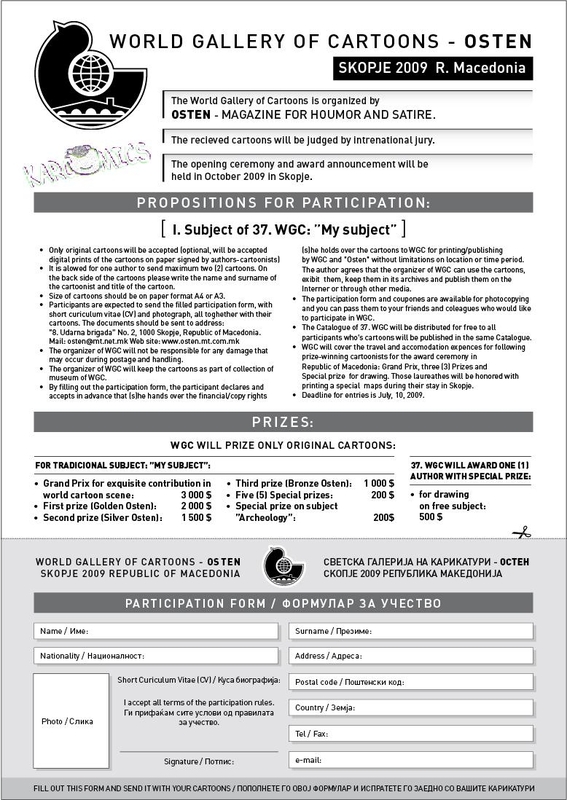 - By filling out the Participation form, the participant declares and accepts in advance that (s)he hands over the financial/copy rights (s)he holds over the cartoons to WGC for printing/publishing by WGC and Osten without any limitations on location or time period. The author agrees that the organizer of WGC can use the cartoons, exhibit them, keep them in its archives and publish them on the Internet or through other media. - The Participation form and coupons are available for photocopying and you can pass them to your friends and colleagues who would like to participate in WGC. - The Catalogue of 37. WGC will be distributed for free to all participants who’s cartoons will be published in the same Catalogue. - WGC will cover the travel and accommodation expenses for following prize-winning cartoonists for the award ceremony in Republic of Macedonia: Grand Prix, First, Second and Third Prizes. - Deadline for entries is July, 30, 2009. - Participants are expected to send the filled Participation form, with short curriculum vitae (CV) and photograph, all together with their cartoons. OSTEN, ”8. Udarna brigada” No. 2, 1000 Skopje, Republic of Macedonia. I accept all terms of the participation rules. Gi prifa}am site uslovi od pravilata za u~estvo. POPOLNETE GO OVOJ FORMULAR I ISPRATETE GO ZAEDNO SO VA[ITE KARIKATURI.